Bonny Blackshear Dorough and Danny Blackshear own and personally manage their condo at the Palms of Dune Allen. The siblings also own and operate Albany Realty Company in Albany, GA, a full service real estate brokerage firm. Albany Realty Company was founded in 1959 by their father, C. Dan Blackshear. Bonny and Danny have been managing the company since the death of their father in 1989. This property is not too far out of Destin but is also not too close to town and traffic. We think we are on the best section of popular 30A. The Vue restaurant, which is one of only three gulf front dining options, is about 100 yards away so you can walk to lunch or dinner. Gulf Place is located about 1/4 mile away and features eclectic restaurants and shopping. They occasionally have afternoon concerts at their pavilion that are free. They have a beautifully manicured lawn to set up an afternoon picnic and watch live music!! Also there is a Tom Thumb convenience store across the street and down about 100 yards. It has items like fresh fruit, a good wine selection and pre made sandwiches. It is very convenient for picking up items when arriving late or if you just forgot something from the grocery store. The Silver Sands Outlet Mall is located about 10-12 minutes away and is probably the largest outlet mall in the panhandle of Florida. Stores include Polo/Ralph Lauren, Nike, J Crew, Banana Republic just to name a few. The unique community of Seaside is just 10 minutes away. Grand Boulevard, which is a high end outdoor shopping area, has a movie theatre, Emeril Lagassees newest restaurant and other high end retail. Small complex with only 24 units. Ours is on the ground floor. 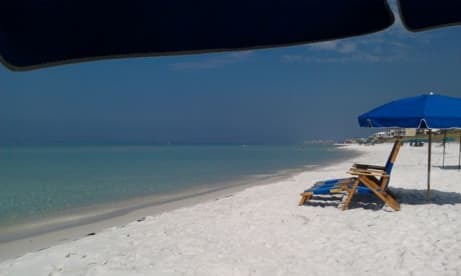 Far enough away from the hustle and bustle of Destin but close enough if thats what you like. A practical benefit is that a new Publix just opened less than 2 miles away. Publix also opened a full Liquor store next to the Supermarket.